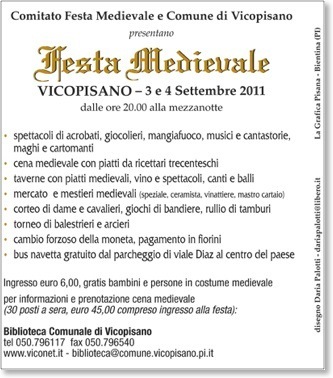 The 26th edition of the Medieval Festival will be held the next 3rd and 4th September 2011 (Saturday and Sunday from 8 to 12 p.m.) in Vicopisano (Pisa). The Medieval Festival 2011 will take place in the centre of the medieval Village and will feature historical groups (jugglers, storytellers, parade of ladies and knight) for two evenings that evoke the ancient life and the medieval atmosphere with taverns, oldmarket crafts, military camps and performances along the historic streets of Vicopisano. This year also the special medieval dinner has been restored and it will be held in the ancient square in front of the Praetorian Palace (cost is € 45 per person by registering in advance). For more info and registration email to: biblioteca@comune.vicopisano.pi.it or call: +39 050 796117 fax: +39 050 796540. What better opportunity to stay at the Bed and Breakfast Le Carabattole near Pisa ?